Just Carrots was developed by AIM to meet the needs of those who believe in the benefits of fresh carrot juice but whose lifestyle is not always conducive to juicing. The goal was to produce a product that provides the nutritional equal to fresh carrot juice, a goal we believe was accomplished. The following chart compares the most recent analyses of Just Carrots, fresh carrot juice, and one 7.5-inch raw carrot done by the three independent laboratories indicated above the columns. A comparison of the nutrient values reveals that a single 2-tablespoon serving of Just Carrots has a better nutritional profile than either of the other two. ENZYMES. 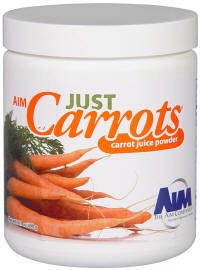 It is more than just nutrients that provide the benefits of carrot juice, it is also the live enzymes. Enzymes are very difficult to test and there is no test available for commercial use that determines all of the enzymes specific to carrots. However, through a qualitative technique known as the protein coagulation test, we believe that Just Carrots is a "live" food. In this test Just Carrots is mixed in a glass of fresh boiling water. Any live proteins in this mixture, including enzymes, will clump and drop to the bottom of the glass. During processing if a product has been heated above the temperature that deactivates enzymes, the product will not clump, but will dissolve into the solution. Think of a vegetable bouillon cube; when you drop it into hot water, it dissolves into a solution because it has been processed and cooked previously. Home Enzyme Tests: I performed this simple test (described above) on BarleyLife, Just Carrots and RediBeets. All 3 powders clumped up with the clump ending up at the bottom of the glass. If you try this test, beware that (depending on the water temperature) both the Just Carrots and Redibeets will cause the water to overflow in a mostly full glass making a mess on the counter top. I also heated BarleyLife and Just Carrots in an oven until the temperature of the powder was at 145 degrees F and in a second test to 190 degrees F. Using the protein coagulation test the powders heated to 145 deg F showed a small amount of damage. The 190 deg heated powders were coagulated coming out of the oven. In conclusion this test showed clearly that each of the BarleyLife, Just Carrots and RediBeets products are enzymatically active. It also showed me that the enzymes are not quickly destroyed. We should emphasize that the power lies in the nutritional synergy provided by carrot juice and not just in the raw nutritional facts. Q: Is the Just Carrots processing temperature high enough to damage the enzymes? ANS: No. In fact the temperature is actually lower than the BarleyLife processing temperature. Q: Are there fewer enzymes in Just Carrots? ANS: No, we do not believe so. Some limited testing showed more enzymes in Just Carrots than in fresh carrot juice. Q: Why isn't the process that is used for BarleyLife also used for Just Carrots? ANS: Carrot juice is different and the BarleyLife process doesn't work well for carrot juice. The BarleyLife process would require that 60% of the carrot powder product be maltodextrin. Q: Just Carrots doesn't taste the same as fresh carrot juice, why not? ANS: A choice had to be made between best taste and highest overall quality. AIM chose the highest quality. Although Just Carrots doesn't taste just like fresh carrot juice, the taste is quite acceptable to us. We mix it daily with BarleyLife and Redibeets and drink them all together. JUICERS: Considering the fact that most juicers (around 80%) end up in a closet within 6 months of purchase, Just Carrots offers an excellent way of getting the benefits of fresh carrot juice without the hassle of juicing carrots. Copyright AIM International, Inc. Used with permission.